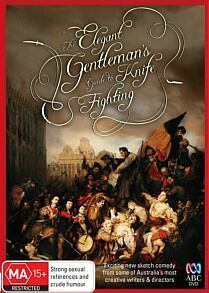 THE ELEGANT GENTLEMAN’S GUIDE TO KNIFE FIGHTING DVD Review The Elegant Gentleman’s Guide to Knife Fighting has proven to be rather polarising, with many lamenting the shows blackly comic sensibilities. Sketch comedy is by its very nature a hit and miss affair; even revered programs such as the classic Fast Forward have more than their fair share of groanworthy moments. Australian sketch comedy in particular has copped a consistent critical drubbing, with the bad taste of failed shows like The Wedge still lingering in the mouth of many viewers. 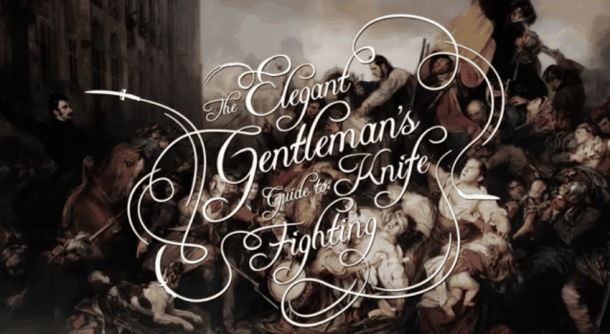 So, it is with trepidation that I sat down to watch the latest foray into short form comedy, the exquisitely named The Elegant Gentleman’s Guide to Knife Fighting. Thankfully I was pleasantly surprised by the latest offering from Jungleboys, the creative minds behind the brilliant A Moody Christmas. Probably the closest comparison I could use when trying to explain the premise of the show is Monty Python’s Flying Circus on LSD, with boundary pushing and taboo subjects falling squarely into their comedic crosshairs. Given its origins as an online comedy site free of the shackles of censorship, the direction of the series isn’t what’s really surprising, it’s the fact that the ABC commissioned such a subversive, potentially alienating program. As such, some viewers may be deterred by some of the darker comedy, such as a hilarious sketch where a young boy wishing to view the cockpit of a plane inadvertently gets dragged into partaking in an Al-Qaeda hijacking, but, in my opinion, there are no sacred cows in comedy and my sense of humour is rather skewed anyway, so I found myself enamoured by much of what was on display across the six episodes. The show features some Gilliam-like animations that serve to break up proceedings a bit, and some truly inspired sketches like the Pornographic movie set OH&S officer, Captain Cook’s unimaginative naming of islands and a man who becomes fixated on the pronunciation of the surname “Smithston” caused me to guffaw out loud. The ensemble cast do a great job with the material and their performances cannot be faulted in any way; on the odd occasion where a joke doesn’t exactly land, the cast’s dedication to the scene prevents it from failing completely. The line-up of talented performers include Patrick Brammal from the aforementioned A Moody Christmas, Phil Lloyd from the equally brilliant Review with Myles Barlow, plus familiar faces from international productions like Damon Heriman from Justified and Georgina Haig, who has appeared in Fringe. The calibre of talent is second to none and lends an air of prestige to the show that should serve to attract curious viewers on name basis alone. It may be a tad premature to call on the basis of one series, but I think The Elegant Gentleman’s Guide to Knife Fighting takes the comedic baton from the aforementioned classic Fast Forward and runs with it admirably, positioning itself at the vanguard of an exciting and edgy new chapter in Australian sketch comedy. Special features include a blooper reel and some sketches that were left on the cutting room floor. The bloopers are exactly the type of fare you’d expect, whereas the unseen footage can be a little shaky; there are some good concepts behind them but for whatever reason they just didn’t land. Having said that though, there are a few giggles to be garnered from giving them a look, and even “failed” Elegant Gentleman sketches are, for my money, much better quality than much of the comedic fare that graces our screens. The Elegant Gentleman’s Guide to Knife Fighting has proven to be rather polarising, with many lamenting the shows blackly comic sensibilities. There are, as expected from the format, some jokes that don’t quite work, but I personally found them to be few and far between; humour is a subjective beast, of course, and what tickles my funny bone may not do the same for you, but if you’re a fan of dark and subversive humour then The Elegant Gentleman’s Guide to Knife Fighting should be right up your alley. I, for one, am looking excitedly towards seeing what Jungleboys and co. have up their sleeves for the second series. Recommended.